"I never start a new day without a friendly welcome from the staff and a warm latte and chocolate croissant from the The French Bakery at Crossroads. I refuel at lunch with the so-very-special French "ficelle with pate and cornichons", if you know what I mean. I always celebrate birthdays and non-birthdays indulging in a decadent and delicious piece of pear almond tart... bon appetite! Merci TFB for sweetening my daily life." "Do you long to experience the incredible espresso you enjoyed when you were on your last trip to Italy? Are you looking for an authentic European cafe, with quality coffee and delicious baked goods? Yes? Then you will LOVE this place! There always seem to be a few tables seated with Europeans; this isn't the typical chain-coffee shop crowd - which is nice for a change. This location has some great seating options outdoors (cool urban courtyard area) and in the building space, too. Free garage parking is a snap downstairs (not sure why someone said you need to park a few blocks away). Many will walk here from the surrounding areas. Last comment - the Owner is super friendly and all about service. Give it a try!" Our croissants have an airy texture and a buttery, rich flavor. The exterior crackles when bit into, giving way to a soft interior. Buttery yet flaky to the touch, this staple product is also available with Chocolate, Apple, Strawberry, Plum filled or the twice-baked Almond Croissant topped with sliced almonds and powdered sugar and many more! we also have a plethora of delicious savory croissants to choose from. We serve Attibassi Crema d'Oro coffee imported straight from Bologna, Italy. A milder blend with a high proportion of sweet Brazilian arabicas, this coffee has flowery and aromatic flavors. African and Indonesian robustas are brought in to enhance the body. As usual, our skillful, gradual roasting helps deliver the best to our final blend. Our Chefs enjoy making creamy, delicious cakes and desserts every day. We bake many delicious cake varieties from our rich, dark Chocolate Mousse to our light, Fresh Strawberry Cake for any special occasions. Please click below to view our Cake and Dessert Catalog. Every pastry and dessert achieves a perfect balance between sweet, salty, creamy or buttery flavors to satisfy you. 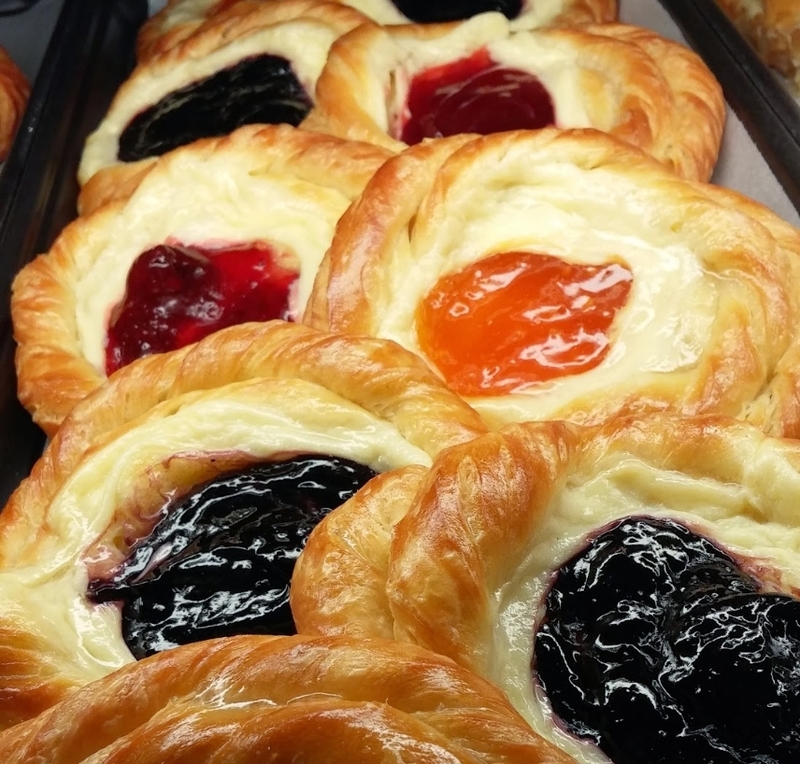 The French Bakery offers sweet-savory buttery pastries, delicious baguettes, and rustic breads that are baked daily. We offer a plethora of delicious cakes, cookies and macaroons. So, whether you're out for your morning coffee and croissant, or looking for a hearty lunch, The French Bakery is the place to relax while enjoying the aromas of freshly baked pastries and bread throughout the day. We use almonds and a variety of fruits on our pastries, as well as our desserts. our quiches and savory pastries contain a wide selection of cheeses. Classic Mille-Feuilles, Dark Chocolate Mousse, Eclairs, Fresh Fruit Tartlets, Pear Almond Tart and Fresh Strawberry Cakes are just some of the delicious desserts we have for any time of the day. We offer many seasonal flavors, so be sure to stop by today! Gourmet sandwiches and crepes are featured at The French Bakery for breakfast and lunch. our delicious paninis include Fresh Mozzarella, , Parma Prosciutto and swiss, Roasted Turkey and Havarti and many more. all our panini's are served on our house baked breads. If you desire a lighter option, we have a variety of salads, some tossed with black olives, green beans, and albacore tuna, and others with fresh tomatoes and a classic balsamic vinaigrette dressing.